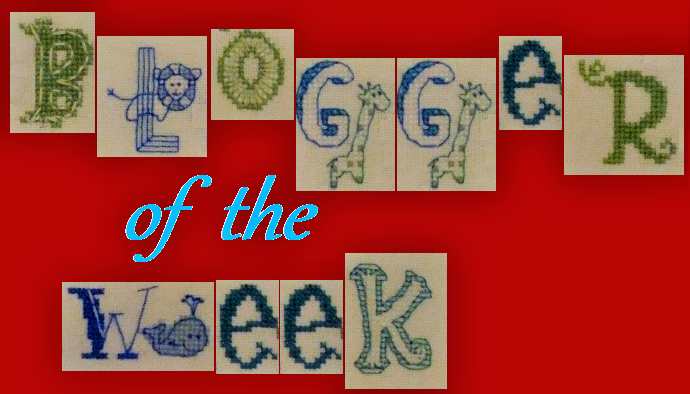 A warm welcome to our second Blogger of the Week, someone who has been an online friend of mine for many years now - I present Gracie! My name is Grace Horton and some people call me Gracie. My dad hated it when someone did. He was very old fashioned. My younger brother never calls me Gracie. 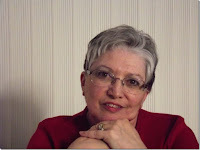 I am originally from Rhode Island and now retired with my husband Dennis in Arizona. My small family is still in RI. At present we have no pets. When we moved out here we had a Schnauzer and a Pug. Dennis and I will be married for 47 years this April (knew each other 10 days). I just turned 70 and it has been hard to say that number! My love for stitching began when I was about 7 when my Aunt Lucy taught me to crochet. That was a summer I will always remember. (Crazy story). 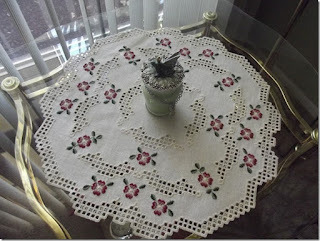 Not too long after that I learned to cross stitch on gingham check and then to sew and then on and on to other crafts. My favorite first sewing project was a skirt sewn entirely by hand when I was only 12 years old. I started my blog September of 2010. The title is from when I sold my crafts many years ago and that was how my license was listed. I just loved the way it sounded. Needles Pins and Dragonflies…….knitting, sewing and magical dragonflies! I am so glad that I started my blog. I have met so many wonderful friends from all over the world. I guess I would say I am eclectic with my crafts. I usually have more than one thing going at once like now; I have a tatting project, a counted cross stitch and a sewing project. I then can choose what to work with depending on my mind set that day. There is no favorite designer as I am quite eclectic with that too. I like a bit of all styles. I love so many of my finishes but I think the sewing doll is one for sure. I saw it in Samplers & Antique Needlework magazine and knew I had to make her. (Vol 20, N0. 2 #75, Summer 2014) Her name is Elizabeth. The designer is Guilia Manfedini. I also did the finishing myself. She is special with the silk threads and silk dupioni dress and of course the beautiful porcelain hand painted doll. It was quite expensive to make but so proud of it. I do not like to think of stitching disasters, but rather hic-cups in the process. I am a determined crafter. 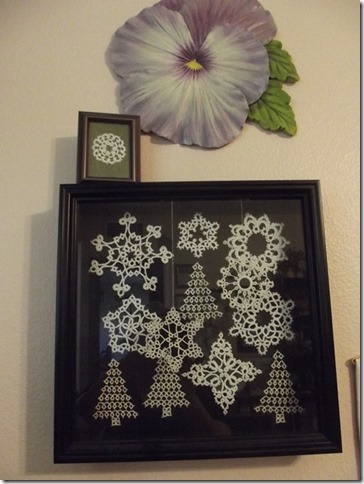 When I set my mind to it, I can accomplish most things….like my tatting. For something new it would be that I am trying to learn to do smocking. My practice piece looks pretty good but still trying to get my hands to do the real thing. I want to do this so I can make Wee Care Gowns for babies who do not survive birth. They are presentation gowns for the parents. Doesn’t everyone have that dreaded box of must get to finish items? I certainly do. I really enjoy the process of finishing so I do not know why my box is waiting! I sometimes give away my finished items but mostly display them in my home. I cannot think of which of my works most represents me. Maybe the Hardanger pieces because they require lots of patience and thought and steadiness. I am a very sensitive person but do not like to show that side too often. I rather like people to think I am very strong. When I leave this world for the Happy World of Crafters I want to be able to do anything and everything so I will fit right in and make new friends. Friendship is so important to me. So far I can say that I can I have learned Knitting, crocheting, sewing, quilting, hardanger, tatting, beading, counted cross stitch, needle punch and almost smocking. Is there anything else I should try? I keep busy every day. My stash, like so many other crafters is a store room of this and that. Thank you Gracie for the interview and the wonderful insight into your life - stitcher, crafter, letter writer and keen contributor to my blog hops too! Grazie Gracie e complimenti per i tuoi ricami. That's a great Hardanger table cloth that you show. A wonderful piece indeed. And Elizabeth is definitely a lady that you can be so very proud of. A real masterpiece. It was nice to get to know you and your love of crafting a bit better. Nice meeting you again although I have been to your blog from time to time!AriadnefromGreece! Nice to meet you, Gracie. Elizabeth is completely beautiful - and how nice that you did the finishing yourself (that's so satisfying, isn't it?). 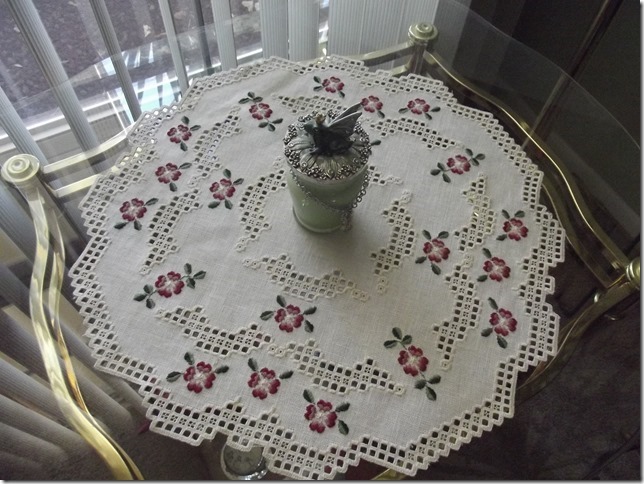 Your Hardanger piece and your tatting tell me you're a very patient and careful stitcher - lovely work! I enjoyed your interview Gracie,your hardanger is beautiful,lovely to find out a bit about you and your crafting. Lovely to learn a bit more about you Gracie. So nice to learn more about you, Gracie! I love your Hardanger and tatted pieces, two things I would like to try one day. A lovely interview, I like following Gracie, she has something always interesting to see and read. Really enjoyed reading more about you Gracie. Did I read that right - that you got married after knowing each other 10 days?! Beautiful work Gracie. Lovely to get to know you too. Nice to learn more about you Gracie. An interesting read about you Gracie. Love the hardanger. That's a wonderful and interesting insight into the world of Gracie! I just started reading her blog a few weeks ago so it was even more interesting to read all this. My goodness, Gracie, you sure have a lot of talent! Thank you for sharing so much about your life and about your crafts! It was wonderful getting to know you! Fantastic interview Gracie! Great answers and just gorgeous pieces you shared. Love this blogger interview idea Jo. Nice to know about you, Gracie! Like you, I am also a multi needlecrafter and enjoy trying new things. I loved your hardanger piece, I have never tried any but sure will some day. Wonderful interview, Gracie. You know, you were one of my very first bloggy friends. I am loving these interviews, you learn so much about the person but I would love to know more (ie the story about those ten days! So romantic, just like a movie. 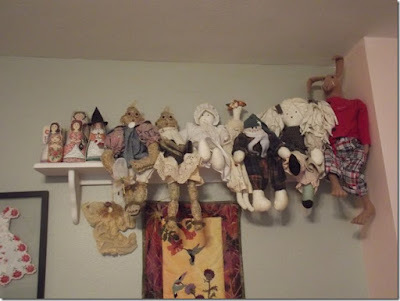 You are such a talented stitcher and I just love your sewing doll - she is so very beautiful. Very pleased to meet you Grace! You are very talented with needles of all kind and have many beautiful pieces to show for all that hard work. Beautiful post. Grace, that doll is stunning! STUNNING!